Oh, this sheet is so fun! From heads (and some just hats) of men, children, women (and an owl?) in fine fashion (all with a bit of green — or a lot!) to snarky text (special thanks to Shannon Cooper for the assistance)! - Pubs: The official sunblock of Ireland. - To me "drink responsibly" means don't spill it. Oh, and The Mad Hatter has made an appearance here, too! All in a nice, small size for ATCs or other small collages. 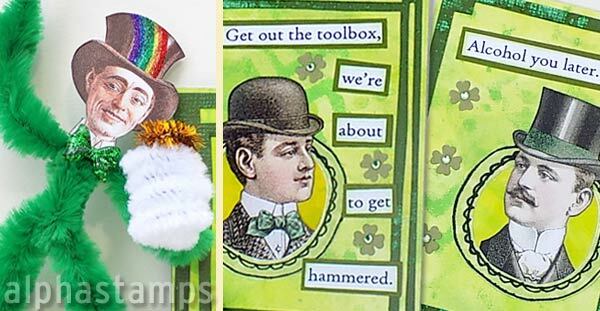 Design Team Member Shannon Cooper made a set of ATCs with Shenanigans and Malarky (see the wide photo below). More info in the blog and/or see the supply list.